Can we talk about how much I want winter to go away? Yesterday we had a huge snowstorm in the Northeast. It was easily the biggest storm of the season. And typically, the day before the storm, I found myself in the grocery store with hoards of other people. They were all loading up on the usual staples: eggs, milk and bread. And me? I had one thing in my cart. Not kidding. Not even a bit. This shouldn’t be terribly shocking. After all, I have a history of this sort of thing. Last storm my cart was brimming with wine and chocolate. Now, to be fair, we had gotten some groceries over the weekend to replace the food that had to be thrown out when my fridge died. (That story in a future post…) But the thing is, if there’s one thing I want people to know about me, it’s this. I believe the key to happiness is small pleasures. So, if I’m going to be hunkered down in the house for a few days, I definitely want to be sure to have wine, chocolate and flowers. 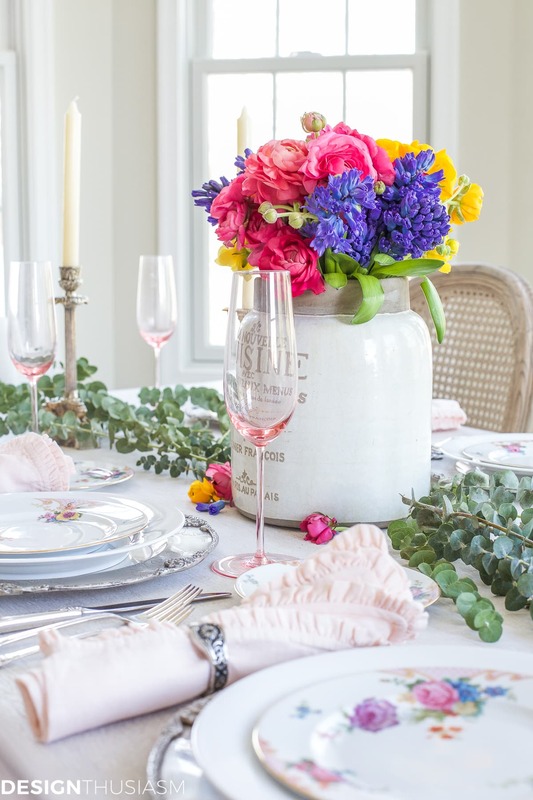 And with lovely spring flower arrangements… come pretty spring table settings. 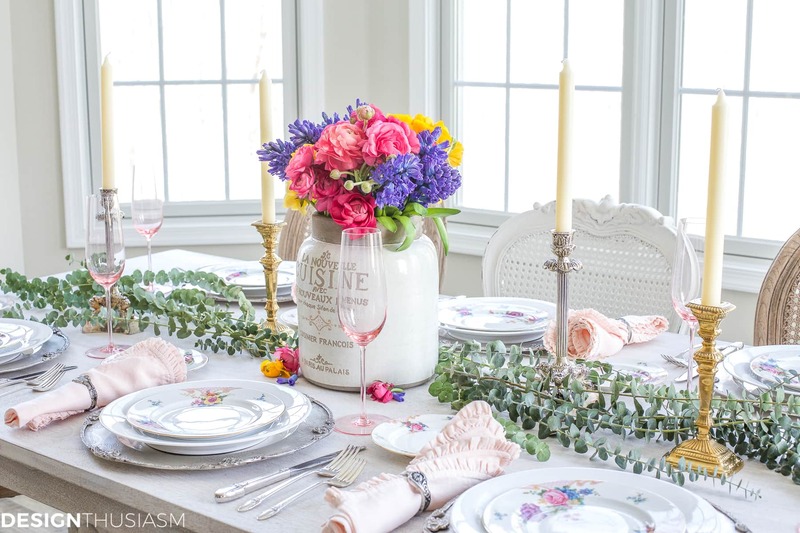 So today I’m sharing my first spring tablescape of the season. 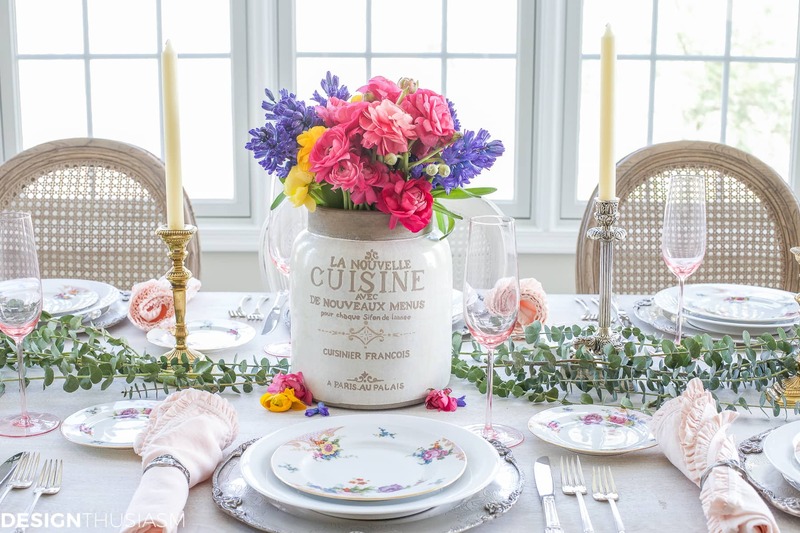 The inspiration for this table started with these vintage French salad plates. 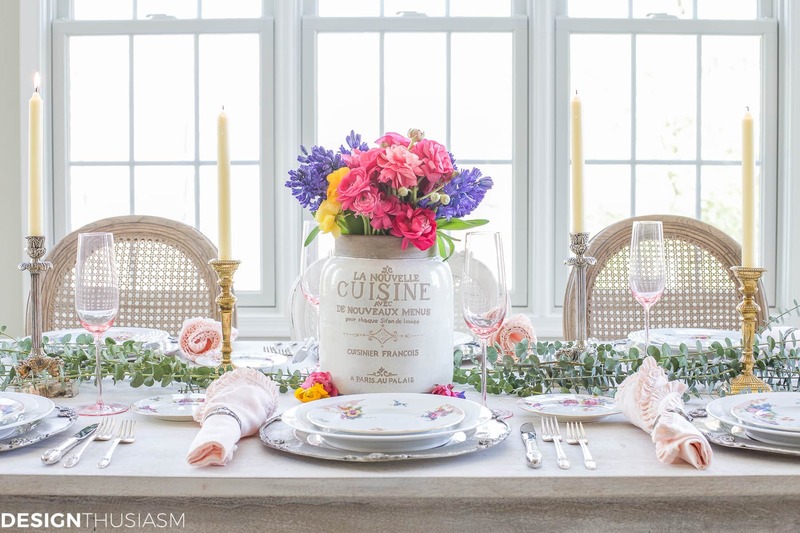 The color is a little stronger than my usual antique dish selections and I knew they would work well with a full color spring bouquet. 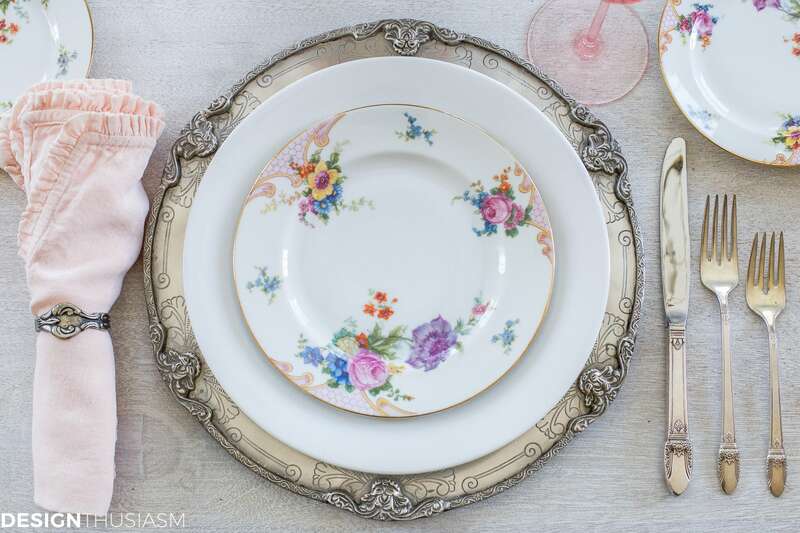 I also used the smaller bread plates for additional color on the table, while the clean white dinner plates function as a crisp underpinning for the floral china. 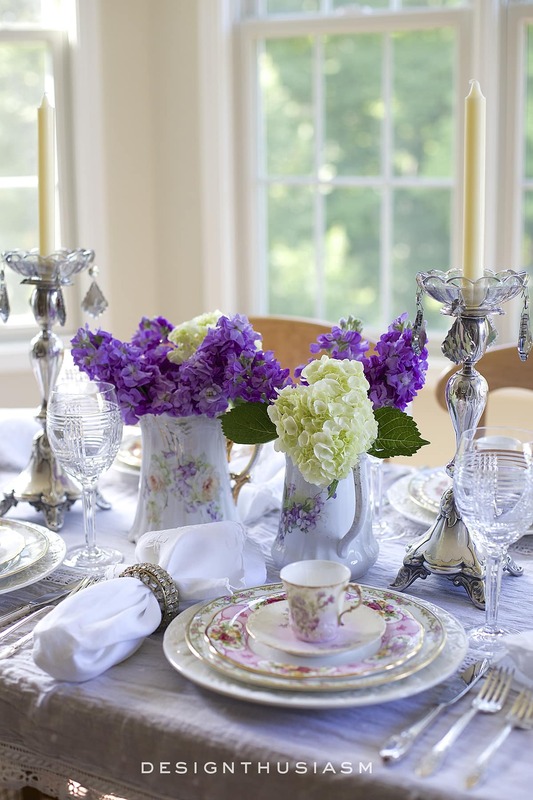 Decorative silver chargers provide the base against the bare white-washed tabletop. I decided to highlight the pink as my key accent color and used my favorite pink linen napkins with their sweet ruffle edging. 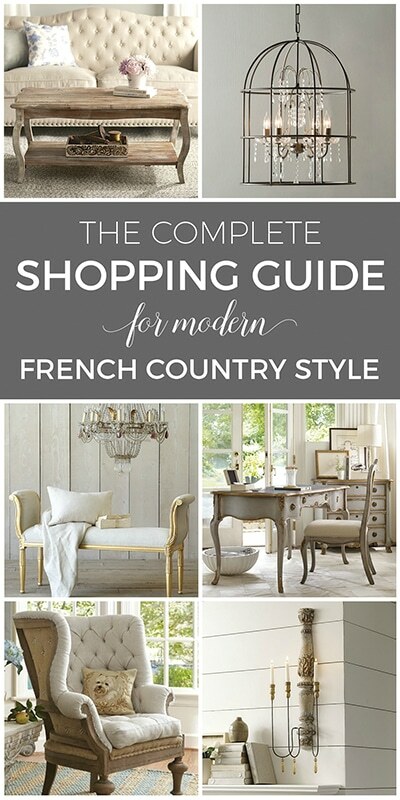 (See resource list below.) Silver spoon napkin rings work nicely with the silver-toned chargers. 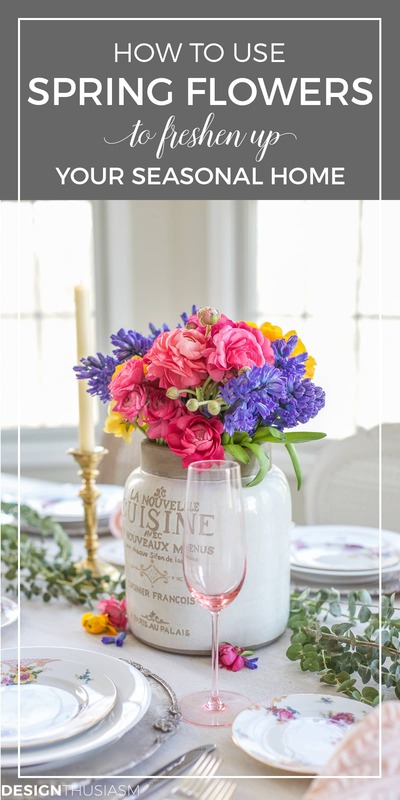 The floral is nestled within a chunky French lettered urn, with eucalyptus branches running down the length of the table. The brilliant light that shines through the generous windows is a wonderful cover for the brewing storm outside. It’s been so spring-like the past few weeks that I was undeterred by this brief interruption and plowed ahead with my spring fever. 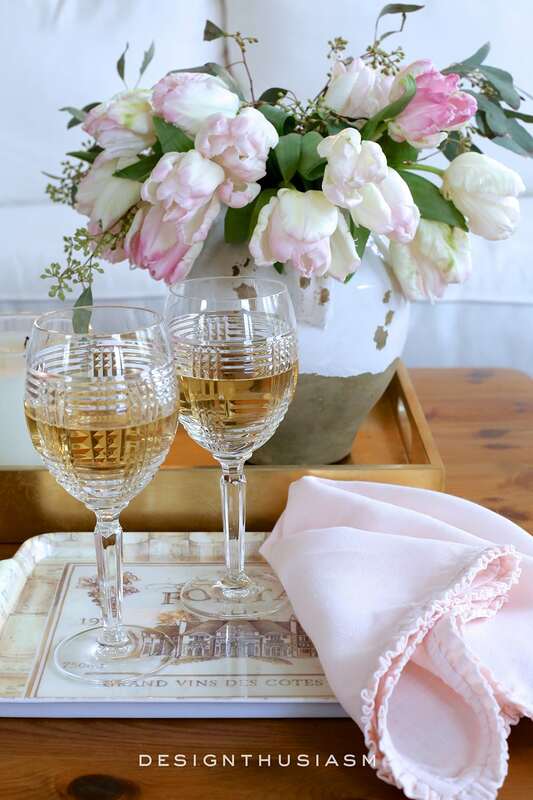 My pink champagne flutes rounded out the picture and I love how they show up so much better against the white table that we recently added. The final touch was a mix of candlesticks sitting amongst the eucalyptus, reflecting my preference for gold and silver casually used together. 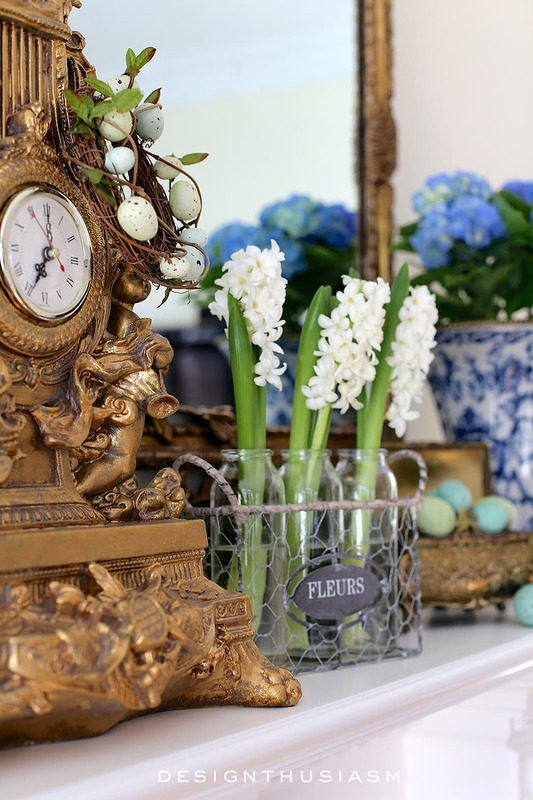 I enjoyed my spring flower arrangements all day today. And I didn’t have eggs, milk, or bread once! Cane back chairs (available May 1) This similar chair is available now. 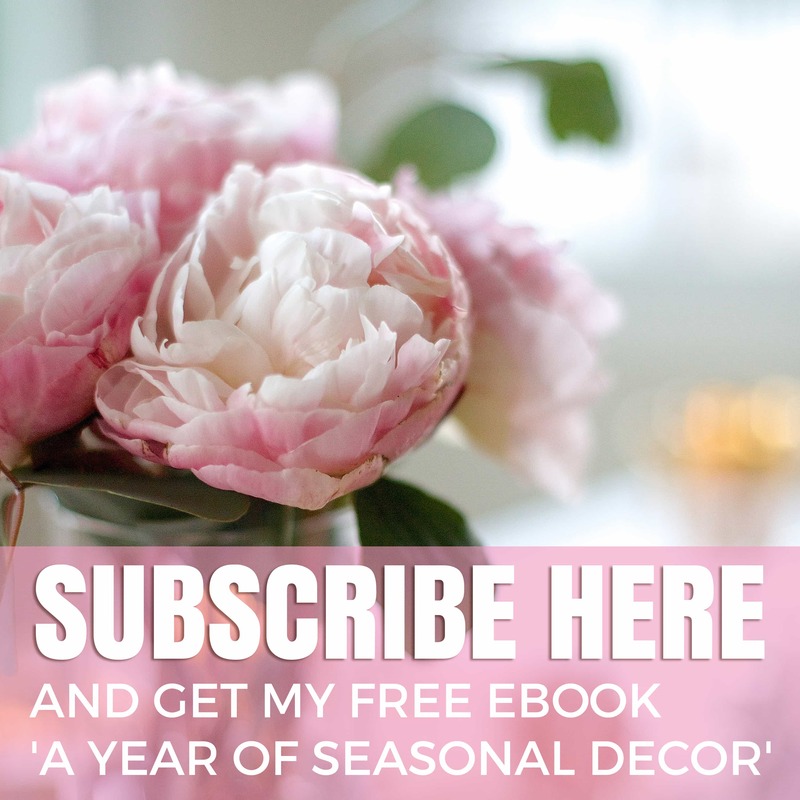 « Home Style Saturdays 25 | I Can’t Tell, is it Winter or Spring? 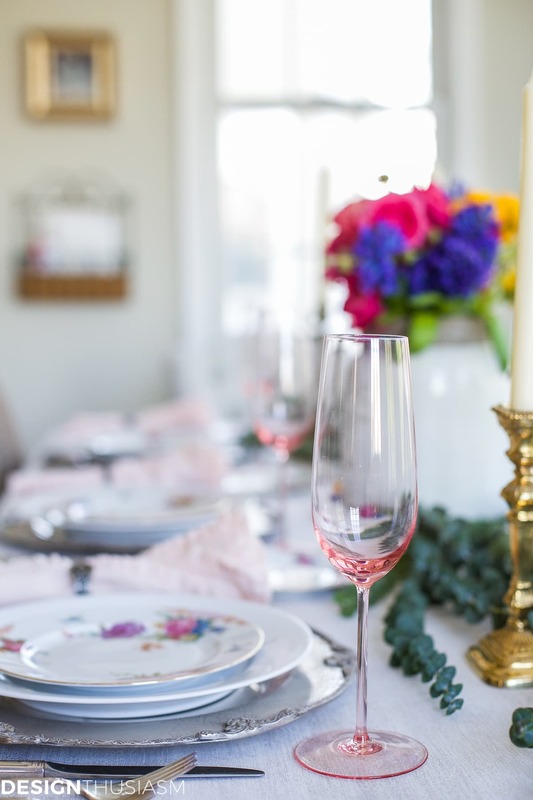 As always, your tablescape is lovely! 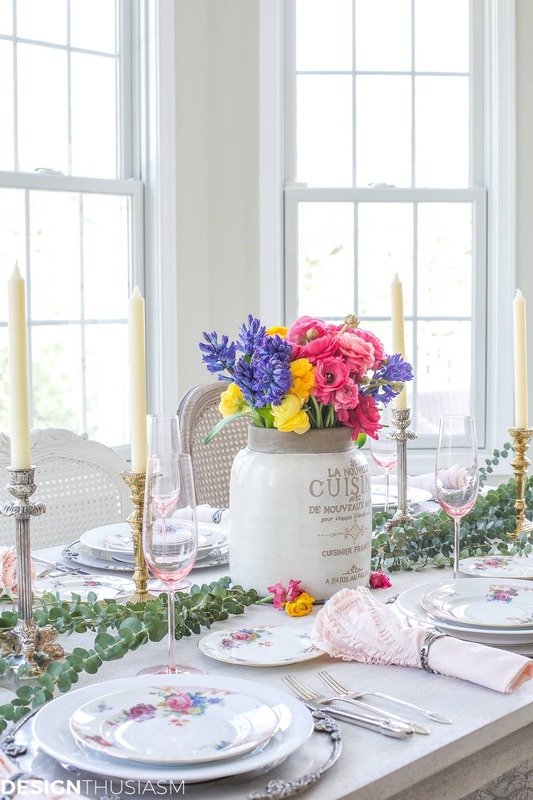 Your flower choices and the china couldn’t be a better match. Sorry for the cold weather. You are brave, I would freeze. In our part of Texas we rarely see a hard freeze. Sometimes it starts to rain and forgets to stop, but snow isn’t common. Stay warm. Lory: All is simply beautiful. 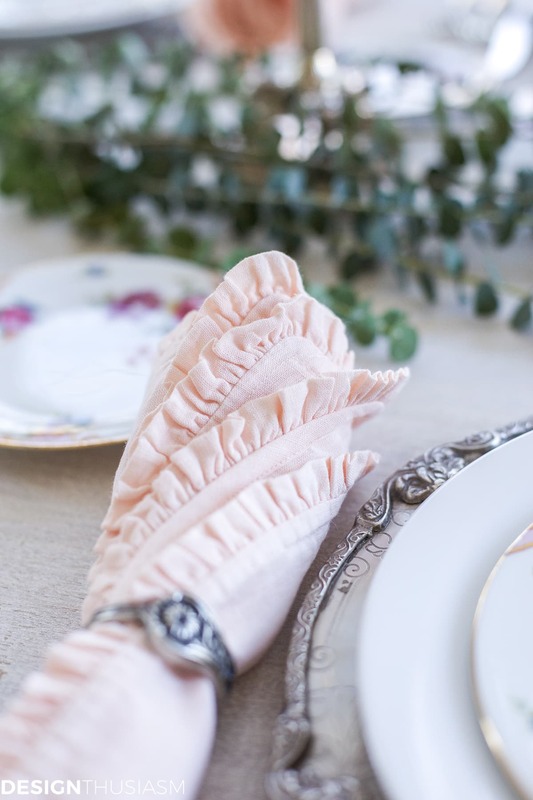 I am especially in love with the blush napkins. They are beautiful and perfect! Thank you for a lovely post. Lori, typical Northeast weather. We just were hoping for no snow for the rest of the year, Oh well. So pretty Lory and I hope that the snow goes away soon! 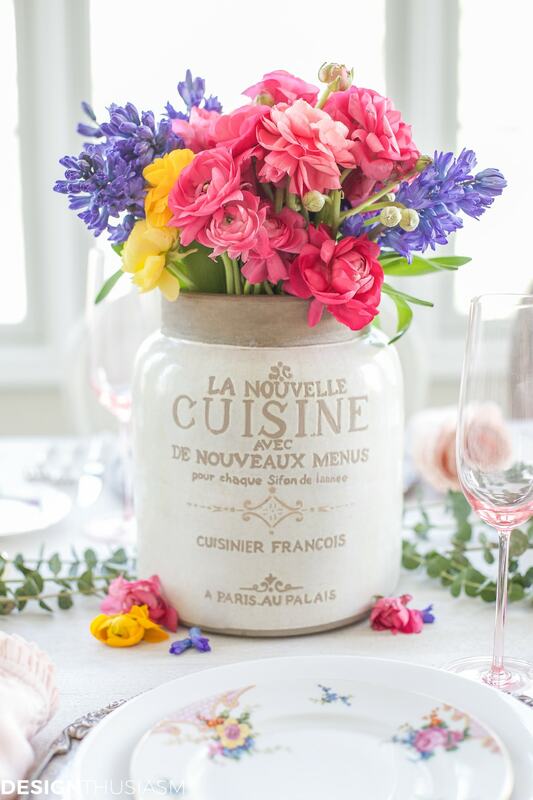 Lory, only you could find the exact flowers for the beautiful plates ! This is gorgeous ! 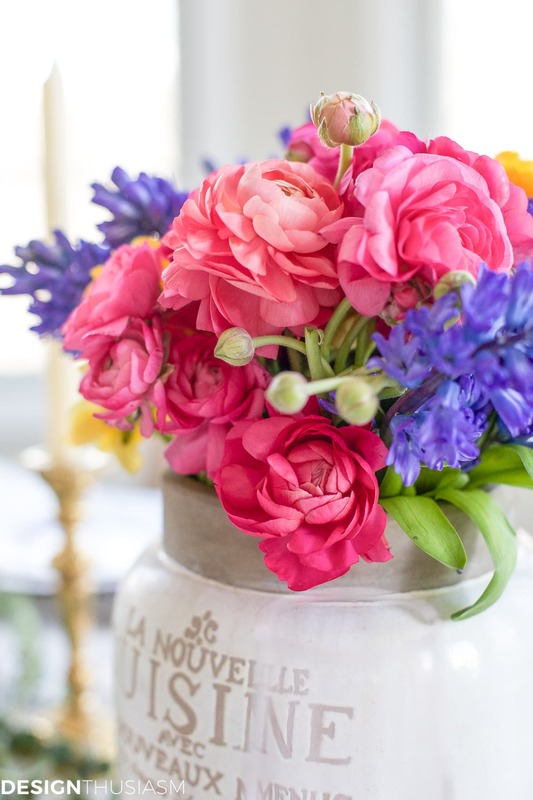 I love the flowers in that French jug. I haven’t seen this before. 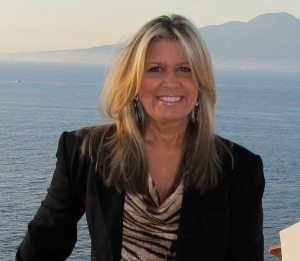 Thanks so much, Debbie! 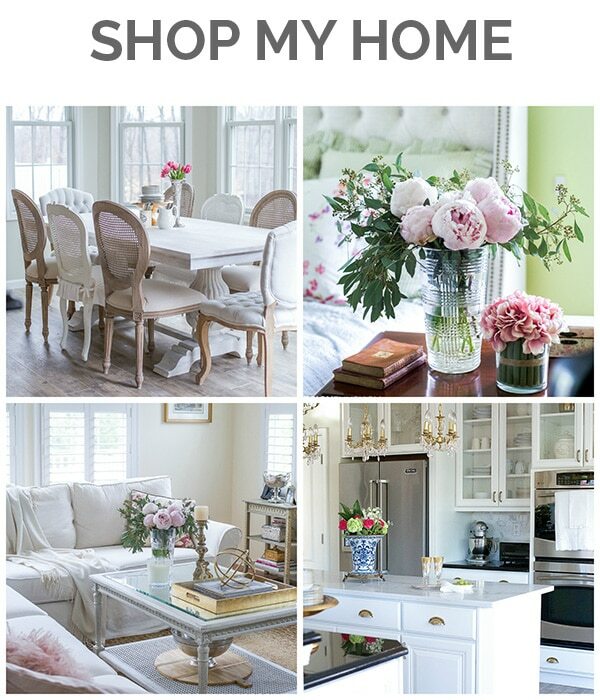 I just saw your lovely home tour, as well. Beautiful!! 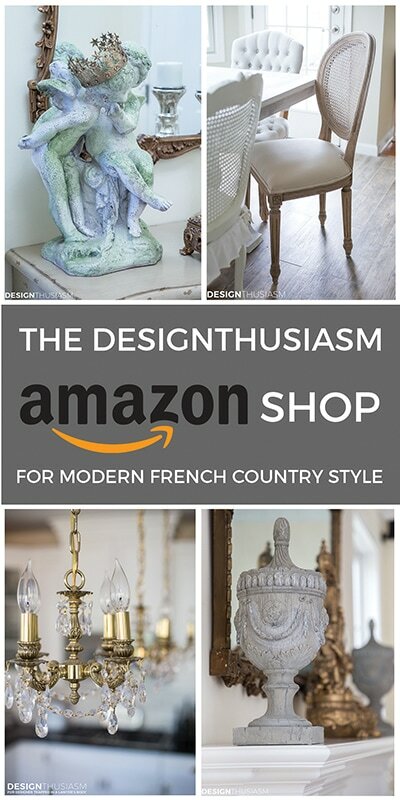 I know this is a late reply to your blog but I was wondering where you found that French lettered urn. Please let me know. Thank you. Love it. Hi Rose! Thanks so much for the kind words!! I think I found that one at Home Goods. 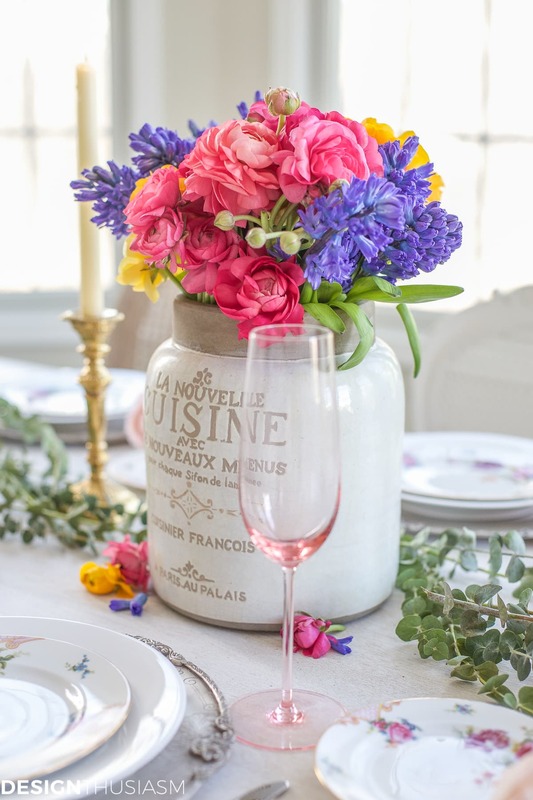 Not only is your flower arrangement gorgeous but so is that vase! 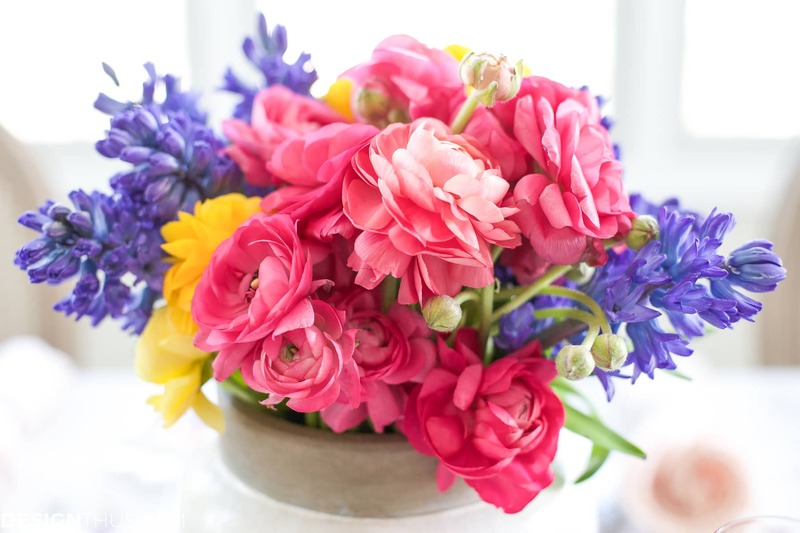 I love your entire spring table. Such a bright and elegant update for the season. Thank you so much for sharing your decor with us at Merry Monday this week!